Surveys of American students find that the majority of us feel relatively good about ourselves and mathematics through elementary school, an opinion that takes a sharp nose-dive starting in about middle school and continues in a downward trend through high school. This pretty much tracks with my own experience. I was usually pretty good at figuring it out and aside from a couple clinkers, I tended to bring home A's and B's. I even managed a surprisingly high score on my college entrance SAT test, an achievement I ascribe to my strategic ability at test taking more than any mathematical aptitude, which encouraged me to continue pursuing mathematics coursework through my first couple years at university even though I had no future plans that seemed to call for those higher-level math skills. But even as I was capable of playing the math "learning" game, I didn't like it. I found it tedious and pointless. When I expressed this opinion around adults I was mostly told, in so many words, that I was wrong. When I shared it with my peers, they mostly agreed it was boring, with the exception of the occasional friend who, was, if not joyful, at least able to take a puzzle-worker's pleasure in ciphering. Those were the friends I chose as homework partners, especially if they were pretty girls, which may at least in part explain why I could keep my grades up while despising the work. Today, as a preschool teacher, I don't attempt to "teach" math, yet all day long I see children engaged happily in both solitary and collaborative mathematical pursuits through their play. It's quite clear to me that humans, young ones at least, take great pleasure in the organizing, sorting, and patterning that lies at the heart of what we call mathematics. They take great joy in counting, in comparing, and in those eureka moments that come with mathematical discovery. It flows through them as naturally as, say, art. So what happens? Is our national "hatred" of math a problem with humans or a problem with how we try to teach it? In his book A Mathematician's Lament, mathematician Paul Lockhart strongly argues that math is an essentially creative, even artistic pursuit, a notion that is rarely reflected in how we attempt to teach the subject in American schools. It is an eye-opening read that really got me thinking. What if we taught art the way we teach math? We start by showing students all the colors, not to play with, but to memorize. Then, after a few years of that, we give them two or three colors and permit them to only paint straight lines over and over until they've mastered them. Then we work on arcs and then other curved lines for a few years. Finally, after many years of this sort of drilling, we move on to shapes where we drill some more. Then comes more repetitive drilling on colors, color mixing, composition, until finally, after many tedious years, the art student, now at a university, is finally permitted to actually create something of his own. Oh, and never, ever take a peek at someone else's paper. It's a ridiculous, backwards idea, but in a very real sense, this is exactly how we attempt to teach math. I have a good friend who holds degrees in both physics and math. He once told me in frustration, "The problem with math in high school is that they think it's about numbers and memorizing and right answers. There are no right answers in math! It's messy!" You see, for him, math is a blank canvas upon which he can explore, guided by his questions and creativity. 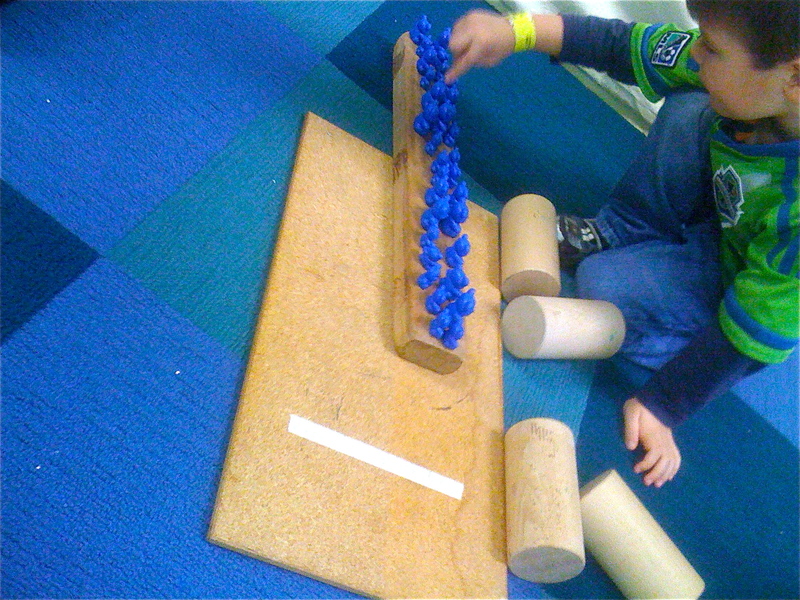 This is how I see math being explored by the children in our preschool classroom. I'm a product of the sort of math education one finds in our schools today: one of rote learning, where you don't get to ask your own questions or express your own creativity. I'm sharply aware of how ignorant I am, but I do know what math is not: it is not algorithms and ciphering, even as that forms the basis of what we call "math education." I do know that math learning can and should be a joyful, fully human experience, one, like art, that is not discrete from the rest of the world, but woven through everything we do, yet we are producing generation after generation of young adults who "hate" math. This is not a problem with people or math, it is clearly a problem with how we expect children to learn it.